WinRT XAML Controls 2013.1 build 122 have been released and are now available for download. This maintenance release adds the Charts grouped axis features described in a previous post, that are currently available in the WPF and Silverlight versions. 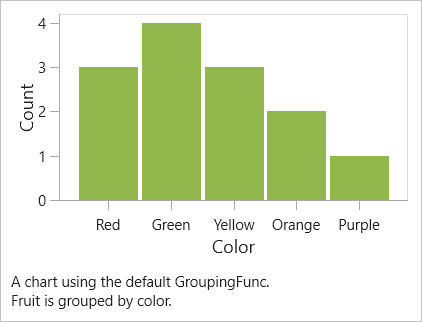 This screenshot shows how some fruit data has been grouped by color and its results rendered to a bar chart. The end tag is automatically inserted and the caret remains where it should be. Indentation guides are subtle vertical lines that render at each tab stop on lines prior to the first non-whitespace character. They help visually align the indentation of visible code blocks. You can see the indentation guide lines in the screenshots above. Whitespace-only lines are intelligent and render indentation guides based on the tab stop level of surrounding text. Indentation guides are disabled by default but can be enabled in the Editor Settings. We also fixed a couple bugs found in the new delimiter auto-complete and word wrap features. Go to the Windows Store to download Code Writer, and help us by tweeting about the app! We’re very happy to announce that v3.0 of our Actipro Icons Essentials product launched today, adding nearly 50,000 new images to the icon bundle! This new version features a number of new icon designs, but more importantly, the icons now come in five size variations (64x64, 48x48, 32x32, 24x24, and 16x16) instead of just two. They also all ship in normal, hot, and disabled states, and in PNG and Icon formats. If you have a need for high-quality icons to be used in a web site or application, please have a look at our product. All our icons are crisp and clear in smaller sizes like 32x32 and 16x16, unlike many competitors who design their icons at larger sizes and never clean up anti-alias artifacts that result when they are scaled down to smaller sizes. Download a free sampler of our icons to check them out! If you are an existing Actipro Icons Essentials customer, you can upgrade to v3.0 with nearly 50,000 new images for just $149 per developer. Bulk discounts are also available. Please email our sales department for assistance with upgrading. In today's post I'd like to announce another new feature coming to the 2013.2 version of SyntaxEditor for WPF and Silverlight: indentation guides. Indentation guides are subtle vertical lines that render at each tab stop on lines prior to the first non-whitespace character. 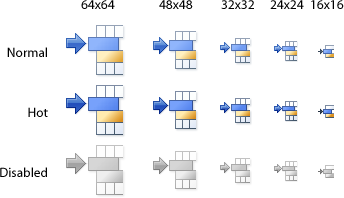 They help visually align the indentation of visible code blocks. These new features will be available in the 2013.2 version of SyntaxEditor! Word wrap has been desired by users for a while, and we've delivered it in this version. 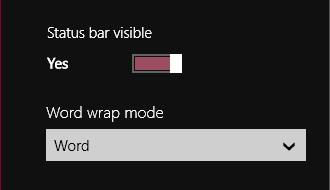 Go to the Editor settings to see the new word wrap mode option. Delimiter auto-completion, described in this post, is where the user types a start delimiter and a related end delimiter is auto-inserted after the caret. This is especially helpful when working on mobile tablets like a Surface since it means less overall typing is required to output the same code. Search results scroll to the vertical middle if scrolling is needed. Labels for documents opened from Box and Dropbox. Many of these new features have been highly requested by users.